Miguel de Cervantes Saavedra (1547-1616) was, without a doubt, the best author in the whole history. In the highest point of the universal literature because of his masterpiece, El Ingenioso hidalgo Don Quijote de La Mancha, Cervantes had a adventurous life that appeared in a ingenious way in the same book. Known as "Prince of the Ingenuitys", he mastered each literary subject, although he stood out in narrative, but his skill in poetry and theatre are accepted. Cervantes born in Alcalá de Henares in September 29th of 1547 and he was baptized eight days later. For the reason of being the birthplace of him, Alcalá was very famous in the world both literal, social, culturally, etc. Miguel's father, Rodrigo Cervantes, was surgeon; his mother was named Leonor de Cortinas. He'd six brothers: Andrés, Andrea, Luisa, Rodrigo, Magdalena and Juan. His sisters were called the "cervantas". Cervantes was also knight and soldier of Spain in his youth. In one of his wars, the Lepanto War (October 7th of 1571), he lost left hand. Because of that he was called the "Lepanto one-handed". He was imprisioned in Argel in 1575, where he stayed for five years. He took care of his family when he returned to Spain in 1580. Four years later, he married Catalina de Salazar y Palacios. Next year he published his first momentous work, La Galatea. But problems didn't abanadoned the writer. When he became a behind-tax collector, he was imprisioned again, but in Sevilla in 1587 at that moment. In 1605 he published his masterpiece, the first part of Don Quijote de La Mancha. In 1614, next year of Novelas Ejemplares publication, Cervantes had another problem. Alonso Fernández de Avellaneda published the book known as El Quijote apócrifo, where both to discredit Cervantes and the environment of the real story. But Miguel got free from that awkward situation with wittiness: the second part of El Quijote (1615) was on the way. The book had succes both in life and afther the author's death. The Byzantine novel Los trabajos de Persiles y Sigismunda was published in a posthumous way. 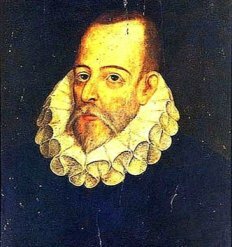 In April 23th of 1616, in Madrid, was buried Miguel de Cervantes Saavedra after a great service to the universal literature. 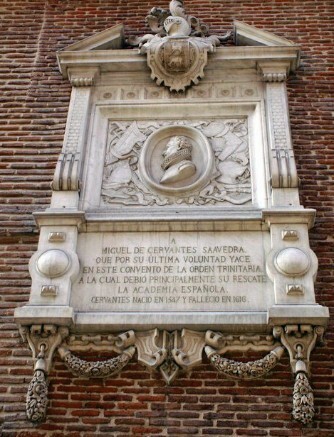 Plaque in honour of Miguel de Cervantes' burial place. 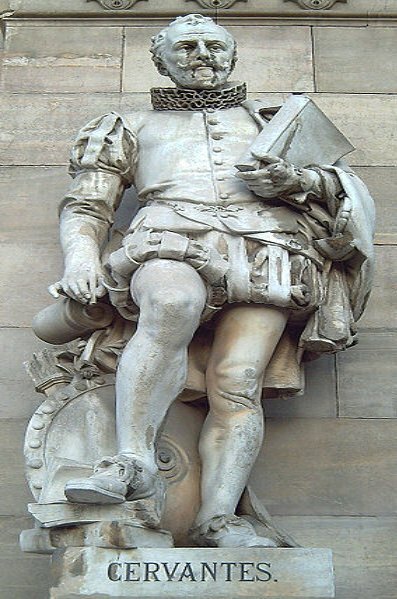 Cervantes' statue in the Spanish National Library. La Galatea. A "shepherd's novel" with only a first part published in Alcalá de Henares in 1585. El Ingenioso hidalgo Don Quijote de La Mancha. 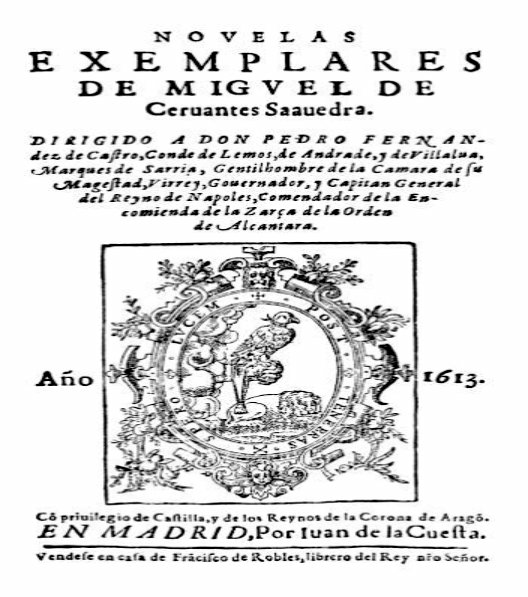 The first modern novel, that destroyed the "cavalry novel", was published in Madrid in 1605 (first part) and 1615 (second part). Los trabajos de Persiles y Sigismunda, historia septentrional. Byzantine novel published in Madrid, Valencia, Pamplona, Paris and Lisbon at the same time in 1617 in a posthumous way. Viaje al Parnaso. Narrative poem based on linked tercets that tells an autobiographical story. Published in 1614. Ocho comedias y ocho entremeses nunca representados. Comedia del cerco de Numancia. Written in 1585, it's the most important theatral work by Cervantes. El Ingenioso hidalgo Don Quixote de La Mancha is the most famous novel in the history. It's assumed as the first modern novel, that one that replaced the "cavalry novel" genre. But the importance of the book has not imagined yet. The first part was published in 1605 in Madrid, in Juan de la Cuesta's printing house. It was for the duke of Béjar, count of Barcelona. This part of Don Quijote de La Mancha begins with a preface where Cervantes makes fun of the pompous erudition, straight after preliminary comic poems where the author praised the book. This writing is a mixture of lyric poetry, epic, tragedy and comedy where there are many genres stories. The novel begins with Alonso Quijano "El Bueno" (el Caballero de la Triste Figura)'s portrait, nobleman of a village who was absorbed in the cavalry novels. That obsession was the end of his sanity, and he believed all the fantasies that he has just read. His madness went so far that he decided became a knight errant for getting a most fair world. Because of that, he fought for his ideas. So he called his horse Rocinante and he called himself Don Quijote de La Mancha; later he chose a farmer woman to be his mind owner, who called Dulcinea del Toboso. After an unlucky leaving and the return to his home, Don Quijote got Sancho Panza as squire in exchange for an island to govern. First return to his home. The earning of the Mambrino's helmet. The prisioner and Ginés de Pasamonte's liberation. A day in Sierra Morena. The country inn events; the wineskins battle. Second return to his home. And here the Cervantes' humour, people taunt, the silly things of Don Quijote, etc. were always present. The second part begins with the Miguel's preface, where he apologized for the trouble with El Quijote apócrifo of Avellaneda and confirmed pity for the difficult novel art. Don Alonso Quijano wanted to return to the cavalry errant universe. So, after a few conversations with the priest and the barber of his village, a new character, bachiller Sansón Carrasco (who will be the Caballero de los Espejos and the Caballero de la Blanca Luna), and Sancho Panza, left his home with him in his last, third leaving. At that chance they went by Aragón and Cataluña. Adventure with the Caballero de los Espejo. Dukes' castle; Clavileño; island Barataria. Don Quijote's defeat by the Caballero de la Blanca Luna. Once the Caballero de la Triste Figura was defeated, he returned sad to his village, where was his last days. A horrible fever and an illness kept him in bed, where after a good sleep Alonso Quijano recovered sanity. After the will events, the last religious confession and the goodbye in the face of imminent end of nobleman, Alonso Quijano died at his home with people who loved him and rode Rocinante the last time to meet God. Narrative skills. Within El Quijote the realism stands out. The author uses the recapitulation; the contrast between the real and unreal things, and among the characters; narrative contrast; the suspense; the obvious humour and literary parody; the perspectivism, etc. El libro de Cervantes ha sido el más traducido y editado de la historia tras la Biblia cristiana. Entre sus múltiples ediciones, cabe destacar las traducciones en catalán, vasco, esperanto, alemán, ruso, croata, quechua, chino, hebreo, japonés y en T9 (texto predictivo). Aventures de Don Quichotte de La Manche, Francia, de Ferdinand Zecca y Lucien Nonguet (1903). Don Quijote de La Mancha, España, de Rafael Gil (1948). Aventuras de D. Quixote, serie televisiva, Brasil (1954). Dan Quihote V'Sa'adia Pansa, Israel, Nathan Axelrod (1956). Rutas de El Quijote, Cataluña (España), documental de Julián de la Flor (1962). La Mancha de Cervantes, España, cortometraje documental de Ramón Masats (1968). Don Quijote de La Mancha, serie televisiva de dibujos animados de Cruz Delgado y José Romagosa (1979). El Quijote de Miguel de Cervantes, obra de televisión de Manuel Gutiérrez Aragón (1990). The importance of the Miguel de Cervantes' book is so remarkable talking about the Spanish tourism, specially at the places that appears in the story or that ones that are present at the world of Don Quijote. Among they, the most famous places thanks to Cervantes' work are: El Toboso, Argamasilla de Alba (Cervantes' ancient prision), Villanueva de los Infantes, La Mancha region, and Alcalá de Henares. Tourism has increased from last years for a very important path that connects the towns that perhaps Don Quijote and Sancho Panza crossed across. It is the Ruta de Don Quijote.